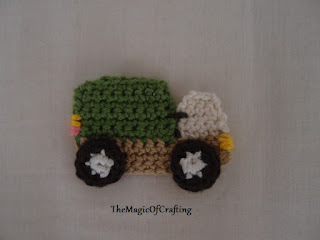 This crocheted mini truck is a nice addition to any scarf, hat or garment for little boys or girls. It takes small amount of any scrap yarn and is fast to make. Only basic stitches are used. With beige: Ch 16, sc in second st from hook, sc till end (15 st). Turn. Row 2, 3, 4: Ch 1, sc in same st, sc till end (15 st). Turn. Row 5: Join different colour (green). Ch 1, sc in same st, 1 sc in next 9 st. Turn. Row 6 -12: Ch 1, sc in same st, sc till end. Turn. Row 13: Ch 1, sc in next st, sc till 2 st left. sc2tog in last 2 st.
Join white in the other end of the beige row and make 1 sc in next 5 st. There should be 1 st left between the green and the white part. Turn. Row 6 - 10 with white - ch 1, sc in same st, sc in next 4 st. Turn. Row 11: Ch1, sc in next st, sc in next 2 st, sc2tog in last two st.
With white in mc ch 1, 6 sc in the magic circle, ss in ch1. With dark brown or black: Ch 1, sc in same st, 2 sc in each st, ss in the ch1. Make two tires and sew them to the truck body. Sew lights with yellow and red/rose colour in front and back. Sew the front with the back part of the truck with another colour (brown). That's it, now it is ready.